Types of flame is very essential factor during oxy acetylene welding. In the welding the appropriate shape, size, type and condition are need to be kept in mind for the controlled operation of oxy acetylene welding. welding flames are classified on the basis of the ratio of oxygen and acetylene gases used while combustion takes place, As the combustion are done after mixing two gases. 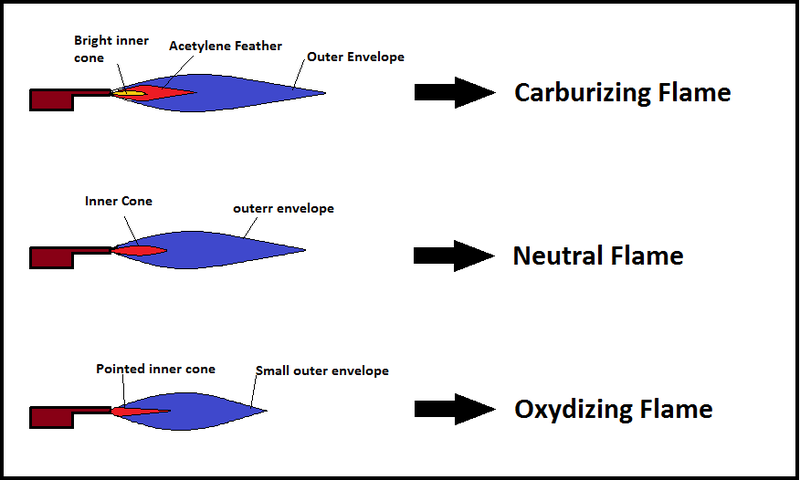 The flame contains two cones, the inner cone and the outer envelope. The type of flame can be recognized by the size and the colour of these cones. There are three types of welding flames. Equal proportion of acetylene and oxygen is to be taken for combustion to produce a neutral flame in oxy acetylene welding. The length of the total flame is shorter than that of carburizing flame and longer than that of in oxidizing flame. As the amount of fuel and oxygen is same so the complete combustion of fuel will take place and there will be no or very small chemical effect on the material. The neutral flame is desired where the need of no oxidising and no carburizing occurs. This type of flame is used for the welding of low Carbon Steel, copper, aluminium cast iron. In this type of flame the inner cone can be seen clearly. Outer envelope is darker than that of inner cone. This flame generates when the amount of oxygen is more than acetylene in the mixing proportion for combustion. The length of total flame is shorter amongst all the three types of flames. The inner cone will be pointed. The blue colour is darker than both the carburizing and oxidizing flame. The oxidation of the material takes place due to excess amount of oxygen. The temperature of the flame will be highest amongst all the three type of flame. Due to the oxides, the appearance of the welding can be bad and there are chances of welding defects. These are the types of flames for gas welding. The selection of flame depends on the type of material to be weld and the required properties after welding. Amount of gases to be mixed is controlled by the hoses levers situated on the welding torch from where the gases will pass. As per the requirement the type of flame can be generated.